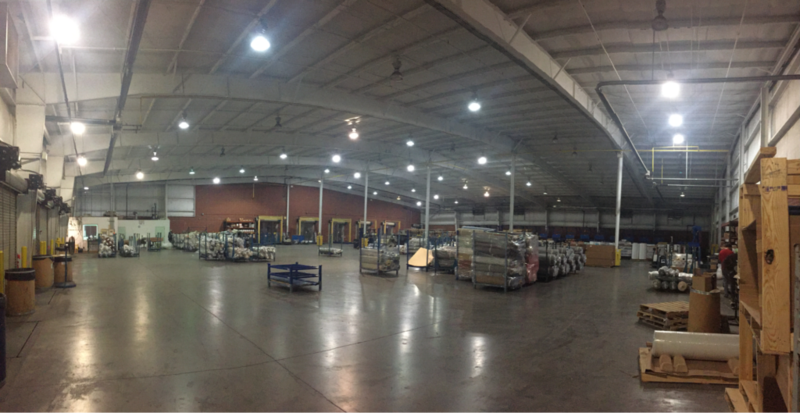 Photo: TSG Finishing’s distribution center (before new lighting). In 2018, TSG Finishing, LLC, in Hickory, NC, requested energy audit services from the North Carolina Clean Energy Technology Center (NCCETC) under the United States Department of Agriculture (USDA) Rural Energy for America Program (REAP). In an attempt to improve its facility’s energy efficiency by replacing inefficient lighting with new high tech LED lighting, the rural manufacturer was able to take advantage of utility incentives, as well as grant funds to complete the project. As of late 2018, the project was completed successfully, resulting in not only more efficient and safe lighting, but also an estimated $19,000 in annual energy charges savings, and a 5-year estimated savings of $97,000, resulting in a payback of 1.6 years. TSG Finishing, considered a small rural business, met the eligibility for the USDA REAP and utilized NCCETC for a third-party review in order to apply for USDA grant funding. The company was awarded USDA grant monies to help the capital expenses for the project, which amounted to about a quarter of the total project cost. In addition, as a Duke Energy client, TSG was able to receive incentives the LED retrofit. The full purchase price (capital cost) was about $95,000, and Duke Energy provided about $58,000. 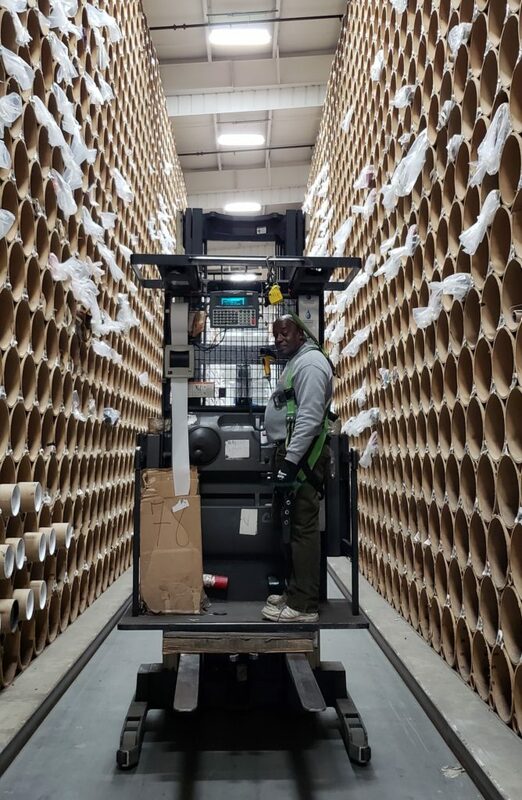 Photo: Open space between paper roll storage and automatic wrapping machine area. TSG Finishing is one of the largest textile finishing operations in North America, and operates in four facilities in PA and NC. Some of the industries served include transportation, marine, medical, construction, military, apparel, filtration, contract and residential. The location in Hickory houses the largest installation of fabric storage tubes in North America. The warehouse is reported to be about 19 years of age, and 70,000 square feet. “We looked at the age and condition of our lighting fixtures and realized the benefit in upgrading the entire lighting system,” said Larry Kieffer, Corporate Engineer for TSG Finishing LLC. As a third party reviewer, engineers with NCCETC evaluated the facility’s lighting and proposed replacing existing metal halide and fluorescent light fixtures with LED fixtures. An occupancy sensor was also proposed to turn on when it senses motion, which can bring energy savings up to 80 percent depending on the setting. It was found that a total of 268,090 kWh could be saved by following a preliminary economic proposal from Lime Energy Services Company. This represented about 58.4% savings compared to the total energy consumption in 2017, resulting in energy savings equal to an annual estimated cost savings of about $18,000 on energy charges and almost $2,700 in demand charges. To learn more about NCCETC’s services, visit https://nccleantech.ncsu.edu/ or contact the Clean Power & Industrial Efficiency team at 919-515-0903 or kjconley@ncsu.edu.